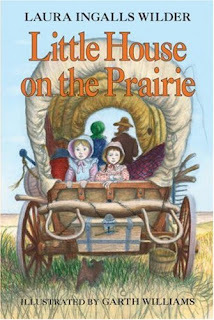 Did you ever read Laura Ingalls Wilder's Little House books ? (Watching the goofy 70s TV show show does NOT count.) I loved all these books as a kid and read all of them repeatedly. A year or two ago, I re-read some of them when I was home for a visit and still found them fascinating, and I became newly aware of the thread of money-consciousness that runs through the entire series. The books go into an enormous amount of detail on what life was like for a pioneer family in the late 1800s. The first book introduces us to 5 year old Laura when the family lives in the woods in Wisconsin. Later volumes trace the family's move westward to the Dakota territory. We learn how Pa makes his own bullets, builds his own cabin and has some of his hair chewed off by a mouse. We learn how Ma makes all the family's clothes, makes the broom they sweep with and cooks meals with the most basic ingredients. As a kid, it just rocked my world that white sugar was something special they only used for company, that an orange in your Christmas stocking was an unheard-of treat, and that anything bought in a store, as opposed to made at home, was a great luxury, a touch of class that made you feel a little less rough-edged, a little more civilized, like the people back East. The idea of living this way will inspire today's DIY-ers. As for other personal finance themes, Pa's money management consists of keeping family's life savings in a box and maybe on some momentous occasion, doling out a penny or a dime for some little treat. But throughout the book, Laura's anxieties about money are a major theme. When Laura is only a teenager, she starts taking small jobs-- she is acutely conscious of the family's need to scrape together enough money to send her blind sister Mary to college, and then to buy an organ for Mary to play when she's home. Laura is not even 16 years old when she quits school to become a teacher-- although she deeply yearns to graduate from high school, she tells herself that making money comes first. Laura denies herself any little pleasures-- it's not that she doesn't yearn for the nice things that other girls have, but she believes that they are luxuries the family can't afford. But Pa, knowing he's got a budding young lady on his hands, kindly gives her ten cents to buy calling cards engraved with her name when that becomes all the rage among Laura's peers, who are starting to go a-courting. And of course, Laura's courting goes spectacularly well: she marries the glamorous Almanzo Wilder, an ambitious young homesteader who has the best horses in town. After their very simple wedding, they suddenly seem to be living the life of pioneer yuppies: he builds her a charming little house full of snazzy touches like customized kitchen drawers. He plants trees outside. Meanwhile, he's trying to grow profitable crops on their farm, using some new-fangled machines. And all of it is paid for on credit. Laura seems to worry about this, but Almanzo is the eternal optimist, always certain that the crops he'll sell tomorrow will pay for all he's buying today. Unfortunately, they don't. Whether or not you read the Little House books as a child, I highly recommend reading them today as an adult, or sharing them with your children. There are many things in the books that were not written for today's sensibilities and will be offensive to many readers, but I think they can inspire discussion and awareness in a way that is ultimately constructive, and a good history lesson. And the rest of the content is fascinating and inspiring-- a reminder of how easy our lives are compared to those of our ancestors, and a lesson in true frugality and sacrifice. I loved those books when I was younger, but I don't remember all of the money themes. Your thoughts are bringing them back. Maybe I will read them again. It always interesting to look back and when things were simpler than now. These books were a BIG part of my childhood. I related to Laura on many levels. She's been inspiration for my attitude that I can make things myself, survive on little, and keep perspective on what is really important. Great to see you writing about them! I loved the books too, as a child and more so now. I was just thinking about Laura the other day, about how she hated sewing buttonholes (though she excelled at it) but took the job to help the family out and felt proud of her contributions. Every few years I go back and re-read The Little House series because I always learn something new. Their resourcefulness, frugality and sheer tenacity (twisting hay for fuel in brutal cold) is inspiring to me and a reminder of how much easier we have it now. Thanks for the wonderful post! I love, love, LOVE the Little House books. I read all of them when I was little, and I actually have my 10th graders read a chapter out of the first book in my U.S. history class (the chapter about the encounter with the American Indians). I think the books really capture a special - if controversial - period of time in our history from a child's perspective. I'm so glad you brought these books to everyone's attention! I remember the family was traveling on a train, and it cost like ten cents for candy or chewing gum and it was a huge deal to buy some. As a kid, I once tried re-creating the candy they made after tapping maple trees and letting the syrup made from the sap harden in pans of snow. I thought Aunt Jemima pancake syrup would work--nope! I could only afford one book from the series in grade school, so I read The Long Winter over and over again. Thank goodness for libraries. I loved the books as a kid! We're not American, and my mom only read them as an adult and she adored them! I think she's read The Long Winter a gazillion times. My favorite as a kid was Farmer Boy, (not exactly part of the series I know) because I could relate to Almanzo's sense of hope and ambition! What exactly would offend today's sensibilities? @Ashie: there are some really racist moments in the series. Pa is a bit more tolerant by today's standards, but if I remember correctly, Ma says things like "The only good Indian is a dead Indian." In one of the books, Pa and some of the other men in town dress up in blackface for a minstrel show. Laura's father makes some money mistakes too. I believe he buys a bunch of stuff on credit when they live on Plum Creak -- boards for the house, glass for the windows-- but the crops fail and he has to find a job. In Farmer Boy, there are some money themes too -- a lesson for Almanzo about spending more for a pig as being a better investment than spending less on candy. Almanzo's family is very well off in that book and I wonder if that background made him live above his means a bit after he and Laura got married. WOW! What a surprise to see the Little House book staring at me when I visited your blog! As a young'un, I was a Little House maniac: books, TV show, visited the museum. In fact, I still call my mother 'Ma' because Laura and Mary called their mother that! As a teacher, student and parent, I have studied the books extensively. There are a lot of things (sexism, racism, sibling rivalry etc.) that I did not catch as a child- and now bother me. I tell parents that the books are still great reads, but please have some discussions about "dead Indians" and "blue eyes are better than brown", etc. I just read See You in a Hundred Years, which is sort of a grown up Little House. A younge couple from New York City by an 1855 farm house in Virginia. They live for 1 year as people in the 1900's would. You might enjoy it. I sure did.